Artist Bela Roongta. Photo by Jack Fennimore. Thirty-six different venues displayed the works of artists from around the Milwaukee area during the 31-year-old Gallery Night and Day over the weekend, according to Historic Third Ward Association. Most of the galleries were concentrated in the Historic Third Ward and especially at the Marshall Building at 207 E. Buffalo St. Just as great as viewing the art was learning about the artists behind them. Here are just a couple of stories. Bela Roongta worked as a lawyer for six years and then became director of courtroom advocacy at what is now known as the Sojourner Family Peace Center. While her parents are from India, Roongta was born in Africa and grew up in London before moving to the U.S. One day she left her friends, family and job to explore her roots in India for six months. Along the way, she learned how to draw henna body art. 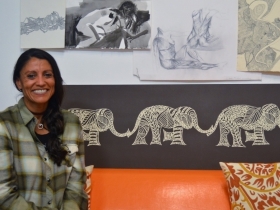 After she returned to the states she developed her unique style where she draws her henna designs in a sketchbook and has them professionally printed on canvas or clothing. She also writes poetry based on her work. She described her art as a “visual journal” where she takes in images from around her and turns them into art. You can see more of her work on her website. Brianna Lynn Hernandez Baurichter specializes in what she calls hybrid art where she takes images of people, animals and more and morphs them into a landscape. The resulting image is meant to be interpreted differently for whoever views it. According to her website, her current project is “Anticipatory/Después.” Having lost her mother to cancer, Baurichter created the series to create an honest, open dialogue about dying and grief. Tom Redman‘s Origins series of paintings pays tribute to the human ancestors that inspired him early in life. According to his artist statement, one day as a child he dug up an unusually shaped stone that his father attributed to ancient hunter-gatherers. Years later, his college archaeology professor identified the stone as a digging tool used by Cro-Magnon Indians from 12,000 to 15,000 years ago. His art is meant to not only pay tribute to ancestors but to inspire people to stay spiritually connected to the Earth and all life, according to his artist statement. 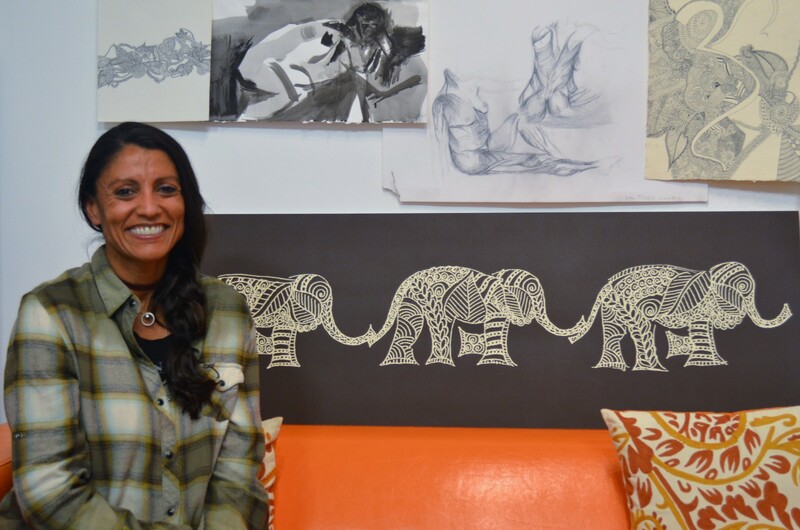 Carole A. Milos attended the Milwaukee Institute of Art and Design (MIAD). 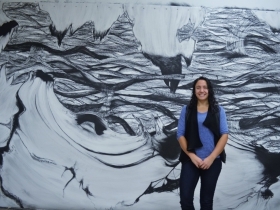 After taking several years away from art, she is once again working as a full-time artist. One of her most interesting art pieces invites people to touch it. The painting uses a special pigment that changes color when heated by touch. You can see more of her work on her profile on the Milwaukee Artist Resource Network’s website. Pamela Anderson is an affiliate and co-managing director of Material Studios + Gallery and was the 2016-17 Pfister Hotel Artist in Residence. 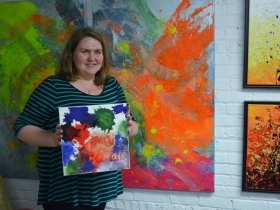 She told Urban Milwaukee that she’s known for the vibrant colors in her abstract paintings. She starts by layering on paint in gestural movements and then develops her art as shapes start emerging. 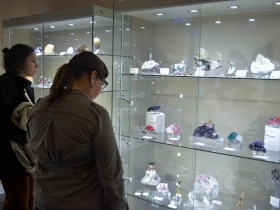 Thomas Shea was featured in our coverage of the Gallery Night & Day last April. 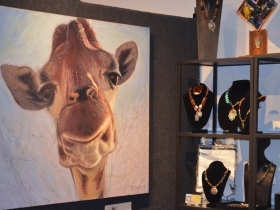 He paints pictures of the giraffes at Fossil Rim Wildlife Center in Glen Rose, Texas where his daughter Molly Shea works. A portion of the paintings goes to the center. It wasn’t just art that was featured at the Marshall Building. Brew City Legends FC, Milwaukee’s new, professional indoor soccer team, was down in the lobby for photos. 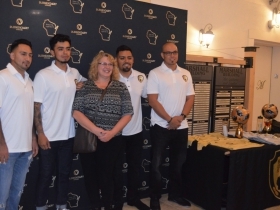 It was also a good opportunity for the players to get to know the city and its people better, photographer Sterling Odom told Urban Milwaukee. The team will have its inaugural season in December. Check out all the unique art for yourself below.